High pressure CVD enabled conformal filling of silica fiber template with zinc selenide for high power tunable infrared lasers and infrared imaging fiberscopes. Advanced Functional Materials v 23, p1647 (2013). Chemical vapor deposition (CVD) is a mainstay of the semiconductor industry. Films of materials useful for chips, solar cells, displays, window coatings etc. are made in large and expensive reactors up to many meters in size. MRSEC researchers have developed a high pressure CVD, which allows for conformal and void-free deposition of semiconductor films in much smaller and less expensive reactors that can deposit in much tighter spaces. 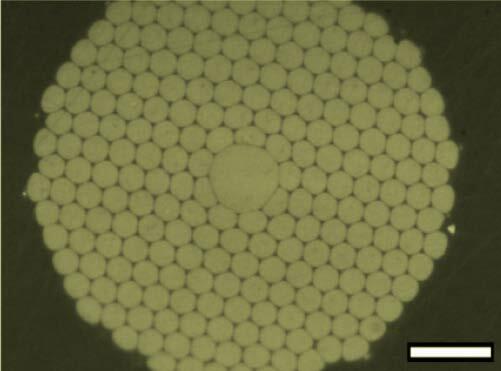 For example, the interiors of optical fiber pores only microns to nanometers in diameter and nanoporous materials can be conformally coated and then filled completely because at high pressure molecules are only a nanometer apart.